How to watch Requiem for a Dream (2000) on Netflix Singapore! Sorry, Requiem for a Dream is not available on Singaporean Netflix, but you can unlock it right now in Singapore and start watching! With a few simple steps you can change your Netflix region to a country like India and start watching Indian Netflix, which includes Requiem for a Dream. We'll keep checking Netflix Singapore for Requiem for a Dream, and this page will be updated with any changes. Requiem for a Dream is not available in Singapore BUT it can be unlocked and viewed! A widow's growing dependence on amphetamines and a self-help television show parallels the struggles of her junkie son and his girlfriend and friend. A pill-popping mom and her heroin-addicted son dream of better lives ... but their nightmare is just beginning. There is a way to watch Requiem for a Dream in Singapore, even though it isn't currently available on Netflix locally. What you need is a system that lets you change your Netflix country. 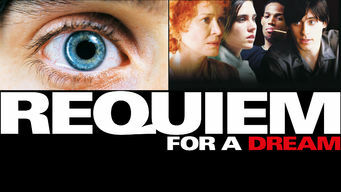 With a few simple steps you can be watching Requiem for a Dream and thousands of other titles! Watch "Requiem for a Dream"